Part 4: Pie Throwing in "Da Flickers"
History tells us that the ancient Egyptians invented the pie—a mix of honey and nuts in a pastry filling. Still, there is no recorded case of an ancient Egyptian throwing one at another ancient Egyptian (although you're not going to tell me that Rameses didn't deserve it!). As such, the tradition lay dormant for millennia—until it became institutionalized in the great slapstick films of the silent film era. The first thrown pie caught on film has been attributed to comedienne Mabel Normand at Keystone. 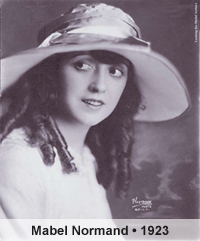 One day in 1913 Mabel Normand, attempting to get the famously cross-eyed Ben Turpin to laugh, picked up a lemon meringue pie which some workmen had brought to lunch with them and suddenly smashed it into Turpin's face. Turpin laughed good-heartedly and wiped the pie from his face. 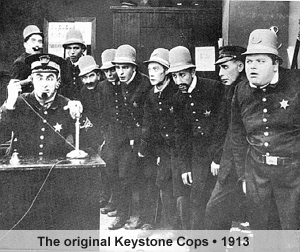 When Keystone Studios founder Mack Sennett saw the scene in the projection room, pie throwing promptly joined pratfalls and mad chases as staples of Keystone comedies. Indeed, the studio was soon buying so many pies from a nearby grocery store that the owner began to specialize in custard pies. "They were a special kind of pie," Sennett once recalled. "They were full of a sort of paste and sticky stuff so that when they hit they didn't splatter too much, but dripped nice and gooey." 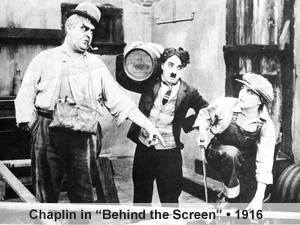 Charlie Chaplin joined Sennett's studio towards the end of 1913, but the only pie to appear in any of Chaplin's films did not appear until the 1916 film "Behind the Screen" which Chaplin made for the Mutual Film Corporation. Chaplin's film is credited with the first ever "pie fight" caught on film. Before this, only single pies were thrown, usually as a way to start a chase or action sequence. Leave it to Chaplin to turn such a mundane act as throwing a pie into a ballet sequence. Chaplin spent so much time achieving perfection in "Behind the Screen" that Mutual was obliged to apologize to its exhibitors for missing the scheduled release date by two weeks. The next great pie fight appeared in the 1935 Warner Brothers short, "Keystone Hotel". The film was an attempt at making a talking short that would epitomize the slapstick comedies of the silent era. The finale, of course, is a massive pie fight in the hotel ballroom while the Keystone Cops rush to quell the riot. Segments of the pie fight are frequently used as stock footage; and it's likely that everyone has seen portions of it at one time or another. The Three Stooges performed their first pie fight in the 1936 short, "Slippery Silks" and continued to throw them until the 1960's. Their greatest pie fight can be seen in the 1941 short "In the Sweet Pie and Pie". 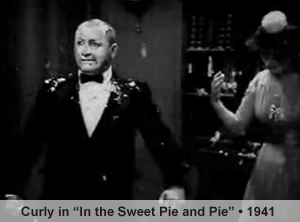 Sadly, Curly Howard suffered a major stroke during the 1947 film "Half-Wits Holiday" during the pie fight sequence. Studio politics forced Moe and Larry to finish the film without him, and Curly's sudden absence from the pie fight is quite obvious. 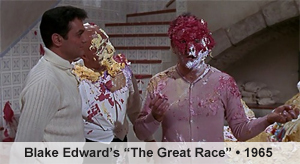 The next great pie fight would not appear until 1965, in Blake Edward's "The Great Race", starring Tony Curtis and Natalie Wood. The pies used during the pie-throwing scene were real, containing fruit, custard, whipped cream and other ingredients. Following this scene the crew devoured more than 300 leftover pies. During the pie-throwing scene there is a running gag with Tony Curtis, who remains clean while everyone else is covered in pie. In actuality, Curtis was required to change clothes several times when he was accidentally splattered with debris from a pie that had hit someone else. 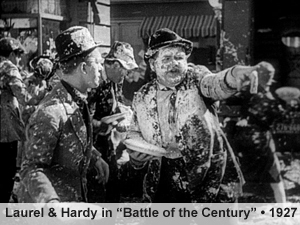 Encouraged by Laurel & Hardy's success, pie-throwing to this day has remained a mainstay of slapstick comedy.